2015 was an amazing year for iSpring and iSpringers. Let’s reflect on the last year’s highlights, and see what the future holds for us. In 2015 iSpring turned 10! It all started with a little group of talented programmers driven by the desire to create high-quality software. Back then in the early 2000s, the company sprang up indeed. A decade later, iSpring celebrated the 10th anniversary since the official release of the first product. Read the complete success story told by Yury Uskov, the company’s CEO. In 2015, the much-anticipated iSpring 8 product line was launched. A lot of major enhancements gave e-Learners amazing new capabilities such as creating conversation simulations and engaging screencasts, easily editing audio and video, and much more. 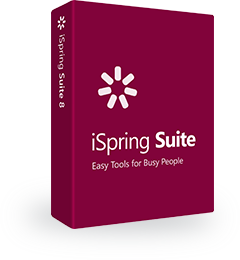 If you haven’t tried iSpring’s most powerful authoring tool yet, feel free to download iSpring Suite 8. This year we created a lot of juicy e-Learning content for your inspiration. Check out some interactive demos that include various presentations, quizzes, video lectures and conversation simulations, all of which were created with iSpring desktop tools. E-Learning never stops developing, and neither does iSpring software. The new iSpring TalkMaster is an effective solution for training and assessing communication skills. This software helps easily create conversation simulations and publish them to online and mobile-friendly formats. Another tool that was released in 2015 is iSpring Cam. It allows users to create engaging screencasts by recording the full screen, or a part of it, and easily adjusting results with the built-in Video Editor. iSpring TalkMaster and iSpring Cam are available both as separate tools, and as a part of iSpring Suite 8. Orlando, FL, Austin, TX and Las Vegas, NV were the cities where the iSpring team could be met in 2015. We exhibited in three big shows: Learning Solutions, mLearnCon and DevLearn, all of which collected a large number of visitors. We were excited to share the latest innovations with attendees, who showed a great interest in iSpring tools. A special thanks to all iSpringers who stopped by our booth and shared their ideas. The iSpring blog represents the wealth of our knowledge: practical tips, useful top-lists, and other e-Learning insights. In turn, your feedback helps us understand what information is most relevant and essential to you. While in 2015 you took interest in various iSpring content, here are the 5 topics that proved to be the most intriguing. Classroom or Online: Which is the Best Place to Learn? iSpring Suite 8.0. Coming Soon. The iSpring communities on Facebook and Twitter have been constantly growing, and in 2015 they doubled in size! Today they are followed by 5,373 and 6,661 people, respectively. We appreciate your attention, and promise to bring a lot more useful articles, video tutorials and other materials in 2016, so stay in touch! O If you have any questions or suggestions, you are more than welcome to let us know. Since the beginning of 2015, we at iSpring welcomed 56 talented people to our community. Together, we’re all dedicated to one simple idea: to create high-quality and easy-to-use software. Thank you for being our inspiration in 2015! You helped iSpring reach a lot of milestones. This year we will continue to do our best to provide you with the best solutions for e-Learning authoring and much more. We’re curious about your creative work with iSpring tools. Don’t hesitate to share your success story in the comments below!